When clicked by your visitors, the ‘Pin It’ button will allow them to pin an image or video from your web page to their Pinterest pinboard. You can specify which picture or video is pinned or allow your visitor to pin any images above 80 x 80 pixels in size on the page. At present, only videos hosted by YouTube, Vimeo or Kickstarter can be pinned, but Pinterest are working on increasing the number of video sources. 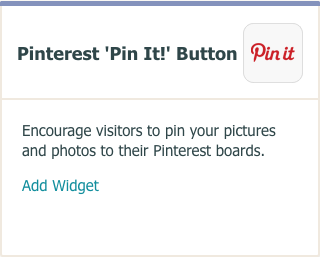 Click on "Add New Widget"
Scroll down to the "Pinterest ‘Pin It’ Button" widget and click "Add Widget"
You can either allow your visitors to pin any image from the page the button is on, or specify a particular image to be pinned. URL of Image to Pin: Enter the source URL for the image to want to pin. To get this, go to the image on your website, right-click (ctrl-click on Mac) the image and select ‘Copy image URL’. Then paste this URL into the ‘URL of Image to Pin’ field, using right-click (or ctrl-click on Mac). The URL needs to have the prefix ‘http://’ in order to work. Custom Page URL: Enter a custom URL for people who click the pin image to be redirected to. It might be the page the image is on, or you might prefer all clicks on your pinned images to direct people straight to your Home Page or your Shop Page. The URL needs to have the prefix ‘http://’ in order to work. Pin Count Style: Choose whether you’d like to display how many times the page has been pinned next to the button, and if so, whether it should be displayed above or to the right of the button. Description: Add an optional description of the image you’re allowing people to pin. This will be included when they pin the image to their pinboard. After making your selections, click "Save Changes". Once you have created the Widget you can follow the instructions below to insert it into the area of your website where you want it to appear. How to display the ‘Pin It’ Button on your "Site Footer"
Click on "Edit Site Footer" on the left hand menu. When the content editor appears, place your cursor where you would like the ‘Pin It’ Button to appear and click the "Insert Widget" icon on the Editor Toolbar (this icon looks like a lightning bolt). Select the Widget from the drop-down list and click the "Insert Button". A grey holding box will then appear as shown in the screenshot below. Once you have added the ‘Pin It’ Button to the places you want it to display on your website you will need to publish the changes to your live website. 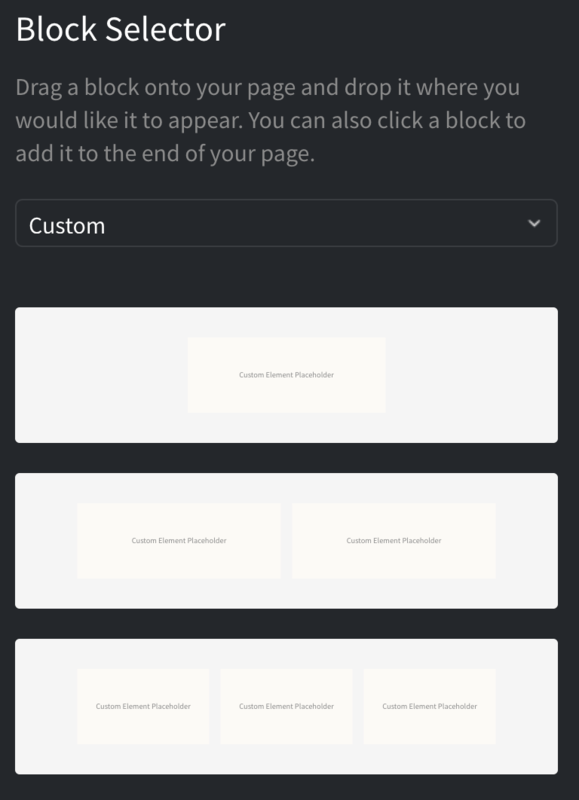 Click on "Publish" on the Top Menu. Click on "Publish to Web". 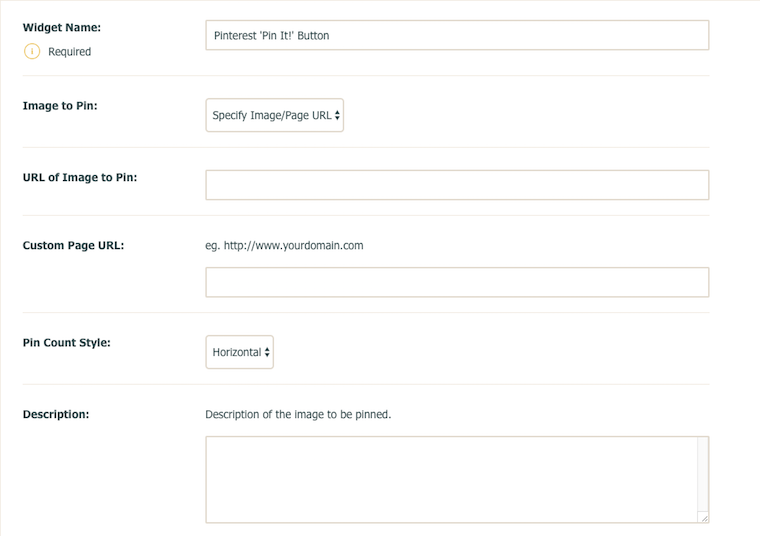 Your changes will now appear live on your site and visitors will be able to start pinning your images.